America's Constitution did not spring up suddenly in 1787. The framers were influenced at every turn by a tradition of constitutional development dating back to ancient times. That constitutional heritage passes almost unnoticed today-despite the fact that it has influenced legislators, judges, statesmen, and scholars for more than two hundred years. Political scientist and legal scholar Matthew Pauley remedies this problem by shining a light on the three most important influences on the American constitutional experience: ancient Greece, ancient Rome, and England. All three helped shape the American system. Athens, for example, emphasised the rule of law and, at least for a time, a kind of democracy. From Rome we derived our commitment to natural law. England provided a tradition of representative government and the common law, as well as models for a jury system, judicial precedent, and habeas corpus and other writs. 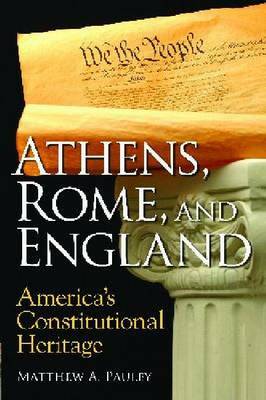 There is no better way to understand the history of constitutionalism than to examine the evolution of the ancient Athenian, Roman, and English constitutions. Highly readable, Athens, Rome, and England: America's Constitutional Heritage tells the fascinating story of the influence these traditions and cultures had on the U.S. experience. No student of law and government can afford to ignore it.